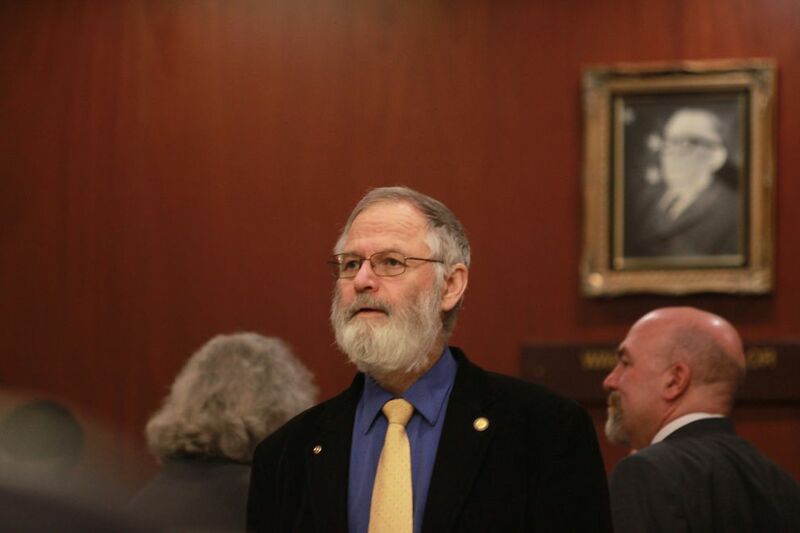 JUNEAU — The Alaska House voted Saturday to institute a state personal income tax geared toward high-earners — a milestone for a majority caucus that pledged to fix the state's budget crisis, even as their proposal appears to face minuscule odds of passing the Senate. All 22 House majority members — 17 Democrats, three Republicans and two independents — voted for House Bill 115, with 17 Republican minority members opposed and Big Lake Republican Rep. Mark Neuman absent. The legislation remains subject to a reconsideration vote before moving to the Senate. 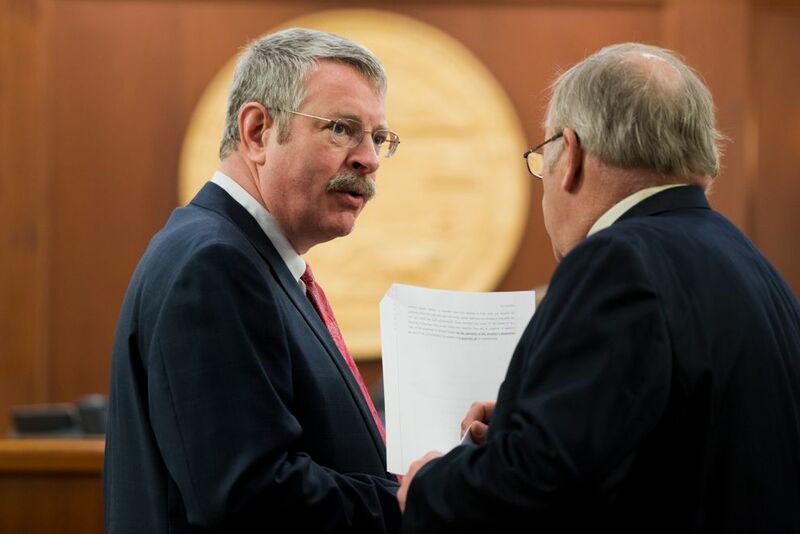 The Alaska income tax — approved the same day federal income taxes would have been due had it not been a Saturday— is one of three planks in the House majority's broad plan to fix the state's deficit of nearly $3 billion. HB 115 would raise an estimated $700 million a year, while separate legislation to increase oil taxes and restructure the Permanent Fund would generate some $2 billion more. HB 115 would leave Alaska with an effective tax rate of 1.66 percent, the fourth-lowest of the 40 other states that levy broad-based personal income taxes, according to an analysis by the liberal-leaning Institute on Taxation and Economic Policy in Washington, D.C. The bill would take effect in 2019. Taxes would be withheld from wage-earner paychecks beginning in January of that year. The first taxes would be due in early 2020. House majority members argued the measure would help avoid budget cuts to schools and the state university system that have been advanced by the Republican-led Senate majority. And they described their proposal as placing a modest burden primarily on higher-income Alaskans — and on visiting workers — who otherwise would feel relatively small direct impacts from the restructured Permanent Fund and resulting diminished dividend checks. 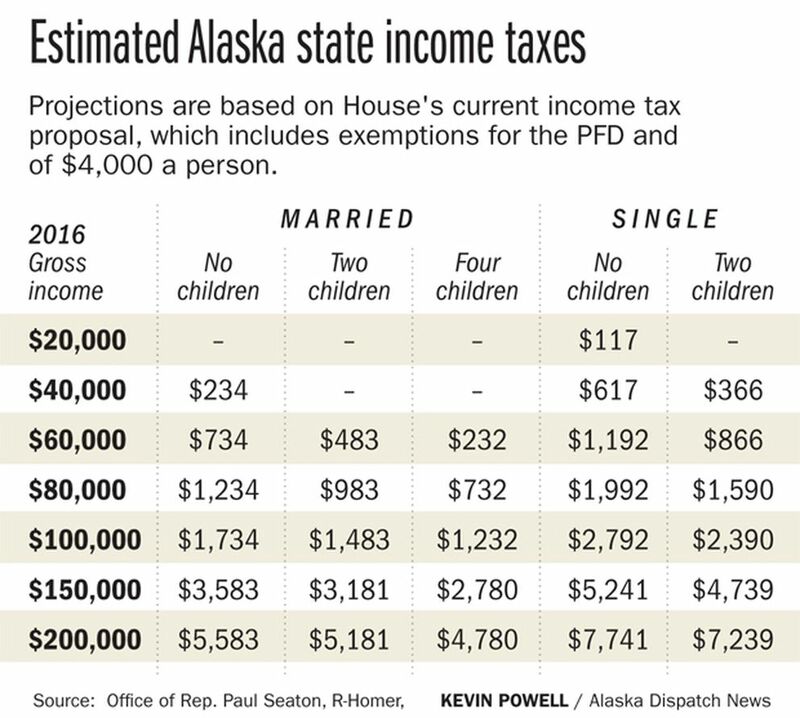 For some poor Alaskans, by contrast, Permanent Fund dividends — which would be sharply reduced from recent highs if the House's full revenue package is approved — make up a significant portion of their annual income. While dividend reductions hit poor residents especially hard, the proposed income tax rate rises from 2.5 percent on annual earnings up to $50,000 to 7 percent of income above $250,000. The top 1 percent of earners would pay about 27 percent of the total taxes due under the House proposal. "Reducing the PFD does not spread the impact fairly," said Rep. Paul Seaton, R-Homer and one of the main advocates for the tax. "This bill is one essential component of a complete fiscal plan. And combined with the other elements the body has already passed, HB 115 will balance and spread the impact equitably across all economic segments of our society." Majority members also argued the legislation would maintain essential government services in rural areas and for low-income residents. The majority has branded the bill an education tax and directs its proceeds to schools, though the Alaska Constitution would allow future lawmakers to spend the money in other ways. "I'm not going to apologize for the fact that smaller communities depend on state government services on a higher per-capita level than the bigger communities," said House Speaker Bryce Edgmon, a Democrat from the rural fishing town of Dillingham, who left his chair for a rare speech from the floor. "We cannot cut our way to a sustainable future in Alaska." 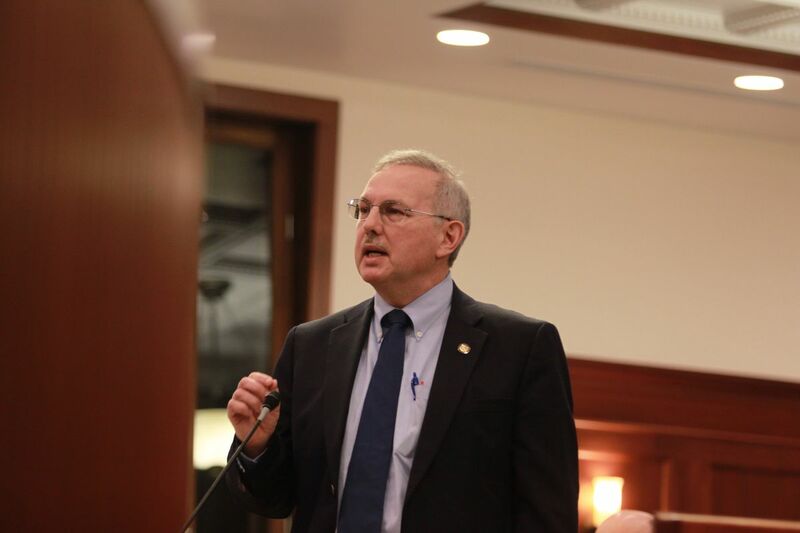 House GOP minority members characterized the legislation as an overreaction to Alaska's fiscal crisis. They have argued a restructured Permanent Fund closes enough of the deficit to keep the state solvent for years, and a rise in oil prices — if one occurs — could help make up the gap the income tax is supposed to fill. "The price is up. Who knows what it will be in three years?" asked North Pole Republican Rep. Tammie Wilson, who was arguing on behalf of an amendment — rejected by the majority — to end the income tax in 2023. Other defeated minority amendments would have established a Pick.Click.Give program for Alaskans to give back part of their dividends to the state, and allowed public employees to return a portion of their salaries to the government. Minority members also described the income tax as taking more from their working-class constituents to help support government workers and lower-income residents. "The way you get more money in the economy is to generate new wealth, not redistribute the wealth we have," said Eagle River Republican Rep. Dan Saddler. "Let's call this what it is: It is income redistribution. It is taking from the haves and giving to the have-nots." The minority's arguments echo the ones made by the Republican-led Senate majority, whose members have effectively declared the income tax proposal dead on arrival in their chamber. Senate majority leaders had downplayed the potential that they'd even have to consider HB 115, arguing the proposal was so unpopular the House was unlikely to approve it. "We were being drawn into a discussion about negotiating about an income tax. Tell me why we would negotiate an income tax that we're against when they haven't been able to pass it out of their own body — and it's never really looked like they could," Senate President Pete Kelly, R-Fairbanks, said at a news conference Thursday before the Saturday vote proved him wrong. "We've said so before and we'll continue to say it: The only thing standing between Alaskans and an income tax right now is the Senate," he stated. If HB 115 were to somehow become law at the end of negotiations between the two chambers, it would take effect 70 years after the Territorial Legislature established a personal income tax set at 10 percent of individuals' federal tax bills. The rate rose to 16 percent by 1961, before the state, in the mid-1970s, switched to using its own tax brackets. But by the end of that decade, after the opening of the trans-Alaska pipeline helped fill state bank accounts with oil money, the personal income tax was under attack. In 1980, the Legislature, in a special session, voted to abolish it. Until the crash in oil prices three years ago, state government ran almost entirely on taxes and royalties paid by producers of the fossil fuel, making Alaska the only state to levy no taxes on sales or income. Swings in oil prices, along with a long-term decline in production, have sparked periodic debate about using Permanent Fund investment earnings or broad-based taxes to help stabilize the state budget. But no such measures have been adopted. "We've been fortunate for the last 40 years to be able to rely on resource revenue to support most of government operations," said Ken Alper, the state tax director. But pressure has grown on lawmakers in the past two years to adopt budget reforms as they've withdrawn billions from reserves, leaving a projected savings balance below $5 billion — less than two years' worth of deficits — at the end of June in the state's primary savings account, the Constitutional Budget Reserve. When the new House majority formed after the November election, moving the chamber away from GOP leadership for the first time in decades, members pledged to approve comprehensive budget reforms even if those steps posed significant political risks. 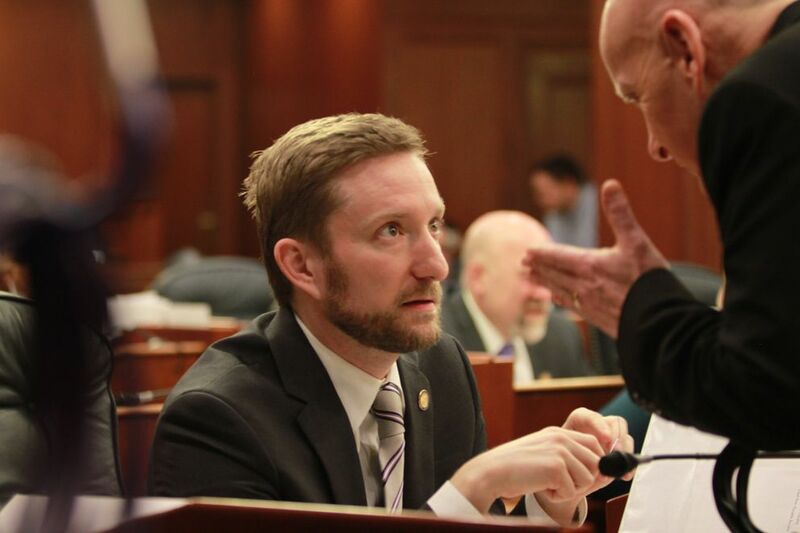 The majority's two independent members — Reps. Jason Grenn of Anchorage and Dan Ortiz of Ketchikan — had wavered on the income tax before voting for it Saturday. Grenn, who narrowly defeated a GOP incumbent last year and was already facing attacks from Republicans before Saturday's vote, said his district, the Sand Lake area, is evenly split on the income tax question. "Clearly, opinions are mixed. There's no easy decision on how we fix our budget challenges," he said. But, he added, "It would not be responsible to do nothing." The fight over an income tax is just one of the many differences between the House and Senate that remained unresolved Saturday, the 89th day of the legislative session. The Senate majority also opposes the extent of the changes in the House's oil-tax plan; it's pushing for a smaller dividend and it's also proposed sharp budget cuts to schools and the state university system that the House majority opposes. A 2006 citizens initiative limited the legislative session to 90 days. But because the Legislature writes its own laws and the initiative itself is a law, lawmakers can simply continue through a 121-day deadline set by the state Constitution. Committee hearings have already been scheduled for next week in both the House and Senate.